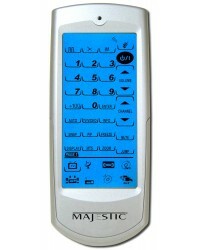 The Majestic RM900 Universal Remote Control was designed to learn upto 8 devices all using a simple touch screen. The high tech LCD panel allows you to add or remove features that you do not wish to use. Example Programming your TV, and you only want Power, Volume Up and Volume Down, Channel Up and Channel Down, and Mute. Then you can remove all the other features so they are not seen when using the Remote. The Majestic RM900 Universal Remote Control is the bet way to reduce your clutter of various remote controls and have them all in one easy to operate unit. Programming the remote control is easy as there are codes for many popular units pre-programmed in the memory of the RM900. However the intelligent programming mode allows you to also program each individual key and function, which you can do by having the remote from your current device and feeding the IR signal from your current device into the RM900. This allows the RM900 to learn each code that you want to program. Auto sensing backlight. When the lighting is low, simply move the remote control, touch the screen, or wave you hand past the top of the remote and it will automatically turn on the backlighting. This makes it perfect for night time use, it saves power and more importantly does not light up a dark room when it is not in use. Where can I register my 3 Year Warranty for my Majestic Product? All Majestic products come with a 3 Year warranty. You can simply keep your receipt for 3 Years and provide this as your proof of purchase. Majestic Electronics is the Global Leader in 12 Volt Entertainment products. Established in Australia in 2000, Majestic has been engineering and developing world leading 12 Volt Entertainment for the Marine and RV environment which can be found on 5 continents around the world. We were the world’s first company to engineer 12 Volt LCD TV’s in 2000 and since then have been leading the industry with state of the art technology such MMMI (Majestic Multi Media Interface), Ultra Low Current Power Draw, One Touch Auto Scan on the TV remote, and Global TV Tuners to work in over 150 Countries Internationally. You can be assured that with our experience in engineering products for over 15 years that our products will survive and perform better than any domestic branded versions when subjected to the tough marine or harsh outback environment, we know this because we stand behind our product with a FREE 3 year international warranty.